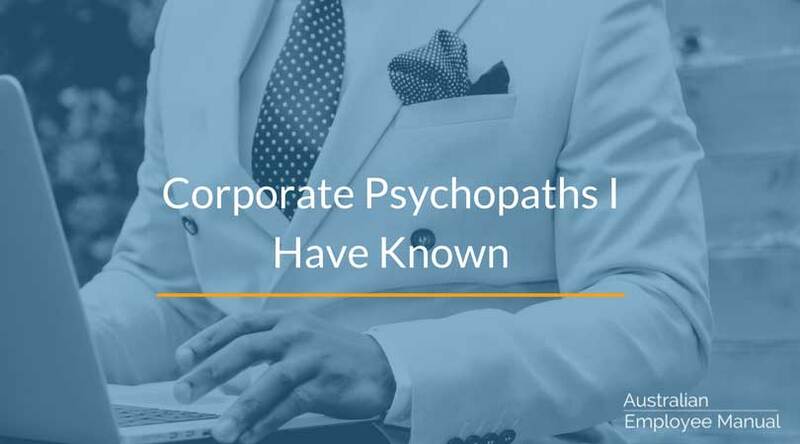 Today we are talking about corporate psychopaths and sociopaths. Not the type that Hollywood loves to portray complete with scary music and blood-soaked knives, and not the ones sitting in our jails. We are going to look at possibly the least known group – the ones who inhabit suburbia and the corporate world. For the two decades I was in Human Resources, and now in my own business, my experience of most people has been generally positive. I believe that the majority of people are essentially honest, decent human beings who do the best they can. But every now and again I bump up against someone who sees the world very differently than I do. Not in the introvert/extrovert sort of difference, but in a way that I couldn’t describe. Way back when I did my Psychology degree, the terms psychopath and sociopath were mentioned in passing during a lecture, but very little focus was put on them. The current jargon is the term Antisocial Personality Disorder (APD) as listed in the Diagnostic and Statistical Manual of Mental Disorders 4th Edition (DSM-IV). While the term psychopath, sociopath and APD all have different clinical definitions, for the purpose of this article I will just use the popular term psychopath. Current research now has psychopaths sitting between 1 – 4% of the general population. This figure jumps when you look at people in jail (15-20%) and senior executives (3.5% from one study). That is higher than the current estimated figures for ADHD … and yet not much is said outside the hallowed walls of psychology and psychiatry. Psychopaths & sociopaths have a personality disorder that colours how they see and interact with the world. Their approach can easily be mistaken for strong or charismatic leadership, but the damage they create in organisations and individuals is extreme. They can divide teams, create massive turnover and turmoil, and inflict psychological damage on their victims. They are often the ones involved in corporate fraud, scams and bullying cases. And in business, they are usually the clients or customers who default on debts. In other words, it pays to try and spot them and avoid them, before you or your organisation become prey to one. Have a talent for “reading people” and sizing them up quickly. They can easily spot a person’s likes, dislikes, motives, hot buttons, weak spots and vulnerabilities. They have no qualms about using this information to achieve their own goals. Excellent oral communication skills. Confident aggressive delivery style with a lack of substance beneath the words. They often have a very charming, engaging manner. Masters of impression management. They are chameleons and change their personas to match the situation and the game plan. Lie with impunity. They tell tales so confidently and theatrically that generally they are believed. If caught in a lie, they are not embarrassed, they just reorganise the storyline into a new story. Have no practical long-term career or life goals, but they weave a very impressive story about their career history (which is generally full of lies). They often have a number of grand schemes on the go at any given time. Are quite often very intelligent, “well-bred” and physically attractive. They have a slight air of mystery, and can be known for a predatory stare and empty eyes. See people as only as valuable as their contacts, money, information, influence, power or what they can do for the psychopath. Once the victim has no more value, they are discarded. If a person is not seen to have value, they are ignored or treated rudely. Are motivated by winning and power. They love playing games with people. They live by the motto, “The end justifies the means”. Need considerable stimulation to keep them from being bored. A penchant for high-risk thrill-seeking behaviours. Often known for speeding and dangerous driving. Flourish in turmoil. If there is no turmoil, often they will create some to put them in a good light or profit from. Have a strong ability to make hard decisions, keep their emotions in check and remain cool under fire. See rules and regulations as irrelevant and made to be broken. They tend not to comply with regulatory or legislative obligations. Are prone to engage in speculative ventures or accept unusually high business risks. Are not team players. They will hog the limelight, downplay other’s contributions, play politics and knife the competition. Often get promoted rapidly through the ranks, without ever taking projects to completion. Prefer to live off others success rather than through their own efforts. Often demand financial support from others (which they never repay), will get others to do their work and will always look for the easy way to do something and make a fast buck. Lack of empathy and understanding of human feeling. They believe everyone is as greedy and unfeeling as them. They can be great mimics of emotions but are emotionally barren (they do not feel love, joy or hope and have no empathy for others). Lack of remorse and guilt. They have no conscience and sleep well at night no matter what they have done. Can have aggressive tempers that flare from out of no-where, but their temper can be controlled if it is in their best interest to do so – saving their vindictiveness for another time. Have a great sense of superiority and entitlement. Believe other people exist to take care of them. Avoid taking responsibility for things that go wrong, instead, they blame others, circumstances, fate etc. They ignore deadlines, and will often turn in work late or not at all while blaming external factors. Ignore financial responsibilities. Regularly default on loans, fail to pay child support and run up debts with no intention to pay them. Are rarely caught or reported, as their victims often are simply glad to be rid of them and are too ashamed at being conned. Often if victims do speak up, they are threatened with reprisals or litigation. Leave lasting psychological scars on the victims who have had their trust betrayed. They feel cheated, defiled and often incredulous that the person they liked turned out to be a psychopath. To be honest, I wish I had known more about psychopaths and sociopaths while I was back in HR. Then I could have perhaps understood some of the corporate psychopaths I had met over the years. I may have understood the CEO who had not paid GST for 2 years, regularly forgot to pay suppliers until debt recovery action was taken, and routinely underpaid employees, while raking in multi-million dollar profits. I could have understood the marketer who regularly marketed bogus weight loss products with the comment, “If people are stupid enough to believe what I write, I may as well make money from it”. I perhaps could have understood the “pillar of the church” business consultant who proudly boasted that while his wife was in intensive care in hospital after complications from childbirth with their first baby, had moved his mistress into his home to look after the new baby and his personal needs, until his wife was better. And I could have understood the senior executive who told me to “Bury the vegies and make them think we are doing them a favour” when referring to a team of long-serving employees within an organisation. But perhaps not. Now at least I have a pretty good idea what I was dealing with.